Me: How and when did you think to use teabags in your art? 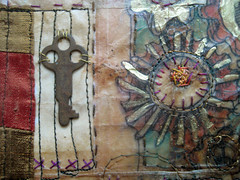 Judy Coates Perez: The first time I used tea bags was when I made Illustrated Document No. 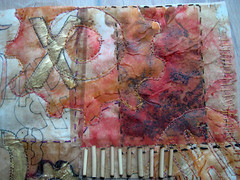 1 for the Quilting Arts true colors paper quilt challenge. 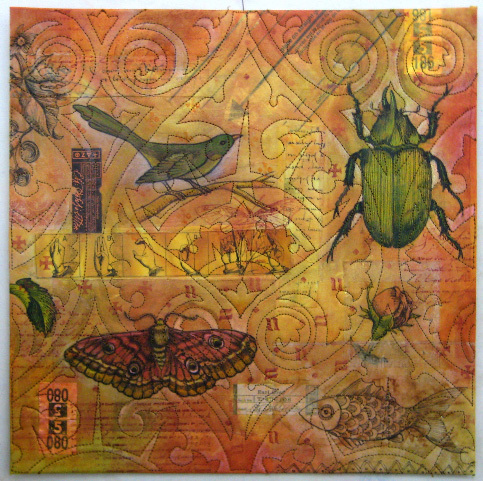 All the illustrated imagery was drawn on individual tea bags, adhered to the fabric. ﻿Me: How do you use teabags? 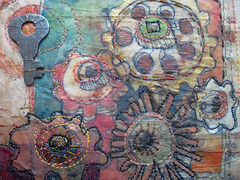 JCP: I have drawn on them with a permanent marker, then added color with paints and colored pencils, put them through my toner printer and printed illustrations and vintage photos on them and I have adhered plain tea stained ones to fabric to make a textured background that I have painted on top of. Me: How do you adhere them? 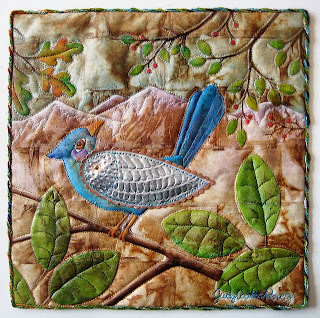 JCP: I use acrylic matte medium and gel medium to glue them to the fabric, but they could also be attached to fabric with fusible web. Me: Any other pearls you want to add. JCP: I like using tea bags because they are a thin, strong fibrous paper and they have a lovely stained patina from the tea. 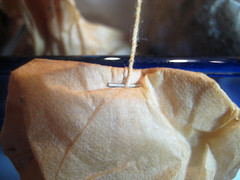 When tea bags are glued to fabric they do not add the bulk and stiffness of regular paper making them ideal for combining with fabric. 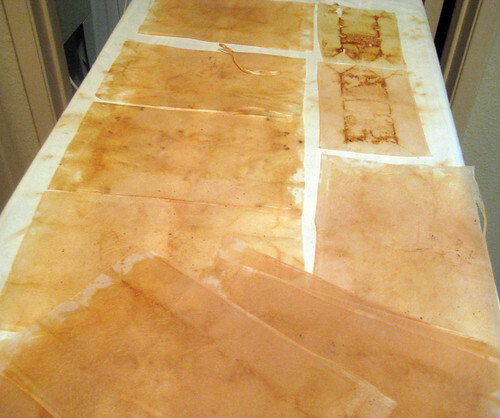 I have also discovered that abaca paper, which can be bought in large sheets, is often used to make tea bags. That's pretty cool because I can put a sheet of abaca in my printer with less likelihood of loosing it, like occasionally happens with a tea bag, lol. 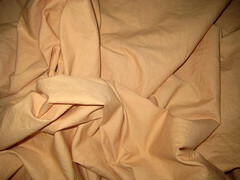 I have recently used abaca in a few projects and see some nice potential for more exploration. Jazzed? inspired? ready to drink tea 24/7 and then make art with the bags? Use the process below and you'll have a supply of teabags to print on, glue on, draw on and some lovely tea dyed fabric too. I just get the big box of iced tea bags (they're larger) and brew them all at once. Tie them together and stick them in a big heat resistant bowl. Add boiling water and steep. You'll what to have two pieces of fabric. 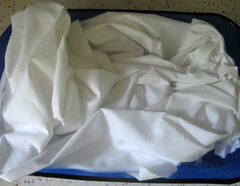 (I use white muslin.) 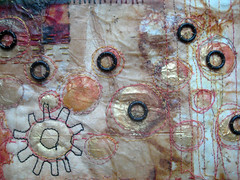 One piece I put in a container and put the used teabags on the fabric to dry. 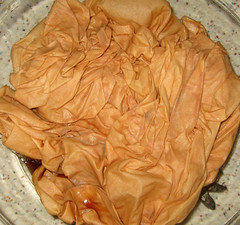 The teabags will stain the fabric and the fabric will soak up some of the moisture left in the used teabags. 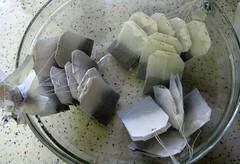 The teabags can take a couple of days to dry. 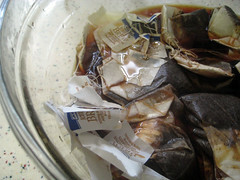 The other piece, you'll put in the brewed tea, after you remove the teabags (previous step). Let the fabric sit in the tea for an hour or two. Wring out, and put in the clothes dryer. 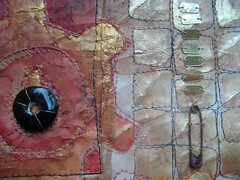 Iron for lovely tea-stained fabric. 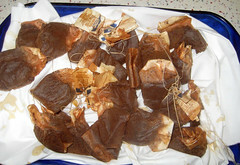 Once the teabags are dry (they don't need to be bone dry) disassemble them. Use a staple remover, or Xacto or fingers to remove the staple. 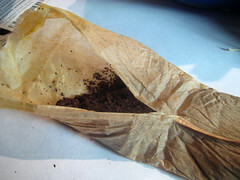 Unwrap carefully, discard tea grounds or put them in your garden. Flatten the teabag paper. Each will be softly and uniquely stained. 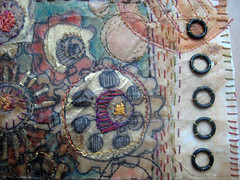 Now you've got your stash of teabags prepared, look at Judy's tutorial on how she applied them to cloth and painted on them. I stayed up way too late last night watching Judy's new dvd (wonderful!) and woke to find her here. 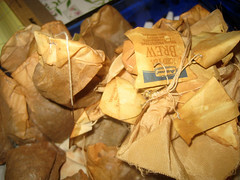 I gathered up tea bags at the Christmas gatherings (much to the amusement of those at the table). I am so looking forward to trying this technique. Jane, your pieces of tea bag art are wonderful. Thank you Jane and Judy! Have a fantastic week. Love this Jane! 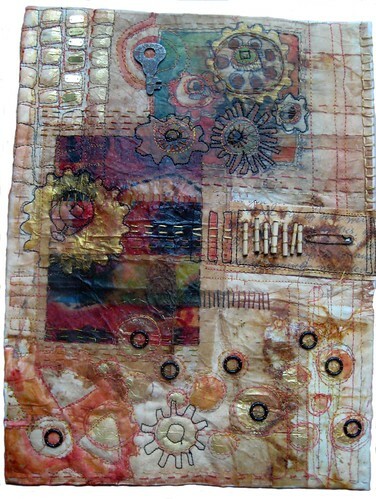 Your stitched tea bag piece is beautiful, the colors are so warm and soft and the stitching adds such great visual texture. O, I want to give this a try! A great post Jane (but they all are!)! I'm impressed with all of your photos on this post....it must have taken you quite some time to get this post looking just right. It's perfect! I also love your tea bag pieces! I'm inspired.....as I was when I first read Judy's article! 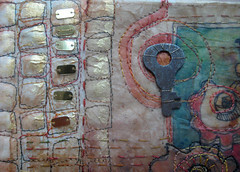 Jane, Your work is beautiful and has inspired me. Now I am excited to get home and buy teabags. 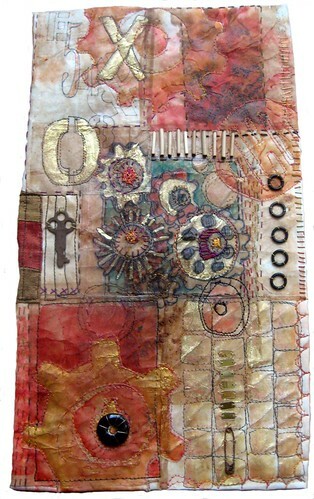 These quilts are just about the coolest quilts I've seen. I love all the little doodads on them. Going over to check out some of your other stuff. Thank you for the inspiration! 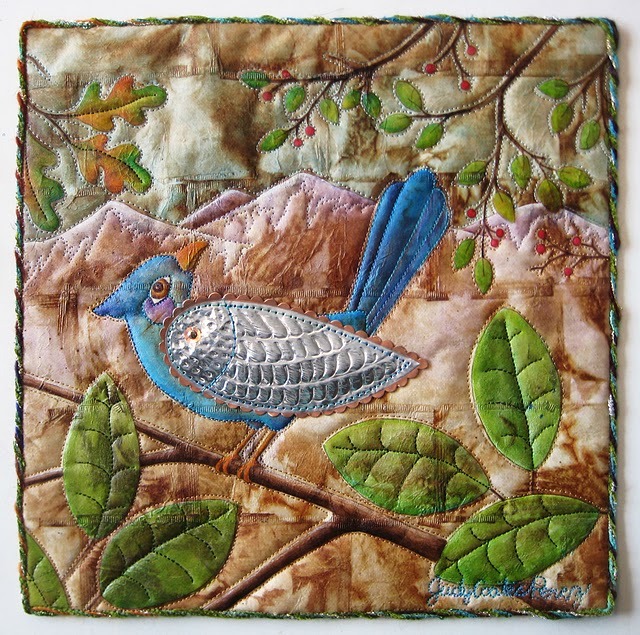 The color choices for these quilts are a visual feast. I sometimes stop and pick up a leaf that has changed color in an especially beautiful way and scan it into my computer for future color reference. 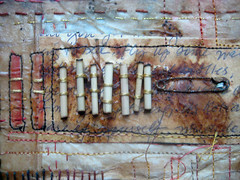 Your work is lovely and the teabags all laid out on the table are lovely just as they are too. I'm going to have to try this. Love this technique and idea! Thank you for sharing it. I am off to the grocery store! Can't tell you how fortuitous it is for me that I found this posting today. Just a couple of days ago I was blogging about how much I'm enjoying tea bag printing, but I also did a little moaning about how tough it is to get the little suckers to go safely through my printer. Thank you for your post (abaca! who knew?). I'm so happy to have found your blog! I cannot get those large bags or the paper here in Sweden, but I will try with a smaller bunch. The tea concentrate was frozen into cubes and dropped into glasses of lemon water,lol. Beautiful work and I love your red spiral background. It made me smile before the page had loaded. Beautiful work. Love the teabags.